Steven W. Lewis was born in California in 1949 to a military family, which resulted in worldwide travels. Musical training began with the study of piano in Germany at the age of 5. He fell in love with the French horn and became obsessed with it by the age of 10. Living near Los Angeles at that time, he studied with Fred Fox, and continued studies with James Miller at the University of Northern Colorado in horn performance. After college, Mr. Lewis decided to move to Chicago furthering his lifelong ambition to become a great horn player by studying with Dale Clevenger, Arnold Jacobs, and John Barrows. At the same time, he was working professionally as a musician in theatre productions, commercial recordings, and performing and touring with the Chicago Symphony. Mr. Lewis has performed to date with the Chicago Symphony Orchestra, Honolulu Symphony, and Florida Gulf Coast orchestras, to name a few. Working in the factory of the renowned brass instrument designer, Renold Schilke, he met Jaroslaw Lechniuk, a master craftsman who learned his skill in the Ukraine before World War II, and worked with Carl Geyer, Chicago’s famous hornmaker. 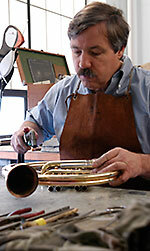 Lechniuk taught Mr. Lewis critical brass instrument restoration and fabrication of new horns, with high emphasis on pride of workmanship. This apprenticeship lasted 4 years until Lechniuk’s passing in 1976. With a loan from the Chicago Symphony brass section, Mr. Lewis established his business “S.W. Lewis Orchestral Horns” in 1977. He continued studies in machine tool technology and metallurgy at Triton College. His shop is a state of the art facility, with an impressive array of the finest equipment available. Dimensions and design of his French horns are derived by careful observation and subsequent reflection, then further developed and refined in an acoustics laboratory. Because of Mr. Lewis’ extensive performance background, he is able to test all instruments with the highest standards of excellence. In addition, Mr. Lewis has many years of experience working as an audio recording engineer and producer, complementing his involvement in the making of instruments of superb quality. After more than 35 years in business he enjoys an international reputation for his own horns and mutes. Finally, Mr. Lewis places high priority on family time. When not working in the horn shop, Mr. Lewis enjoys high performance cars, spending time with his wife, an oboist with the Lyric Opera of Chicago, their daughter, and two Siberian Forest cats.